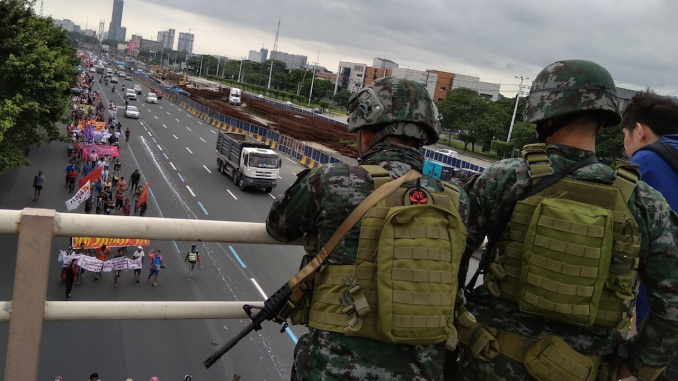 While thousands of protesters marched yesterday at the United People’s SONA, armed officers were dispersed at various points along Commonwealth Avenue in Quezon City. 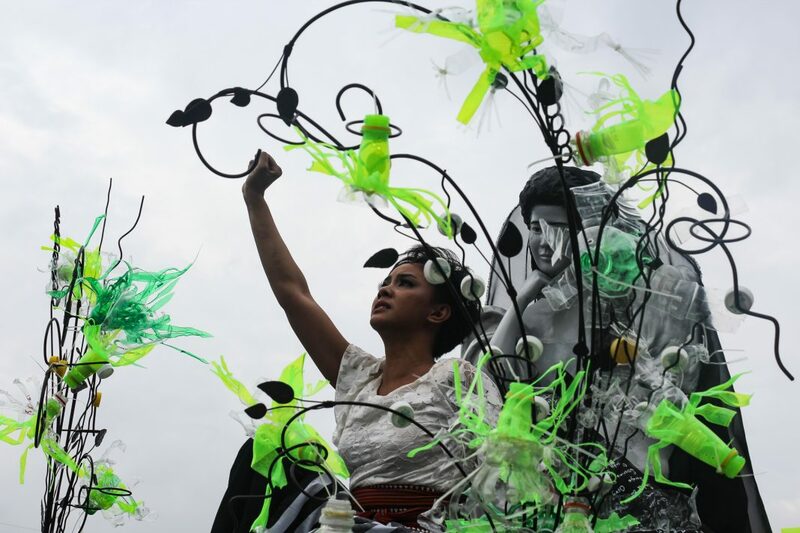 The protesters were also armed, not with guns but with their voices and their art. 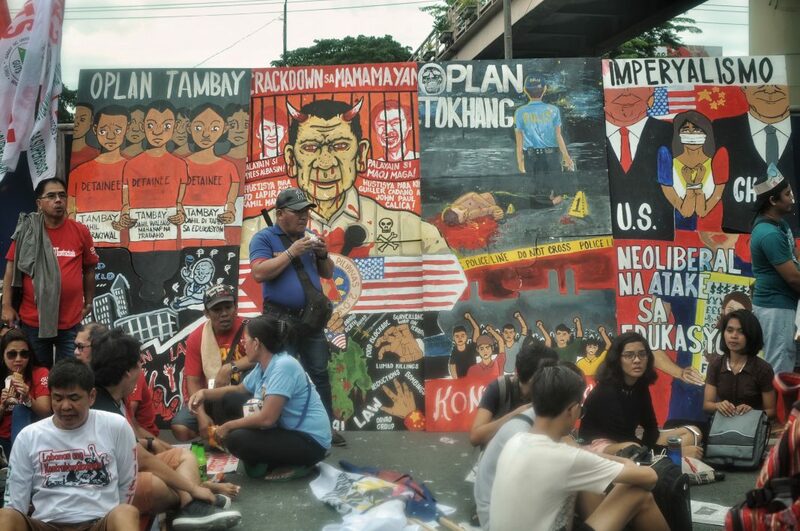 Here are some works of art by activist groups at the SONA protest yesterday. 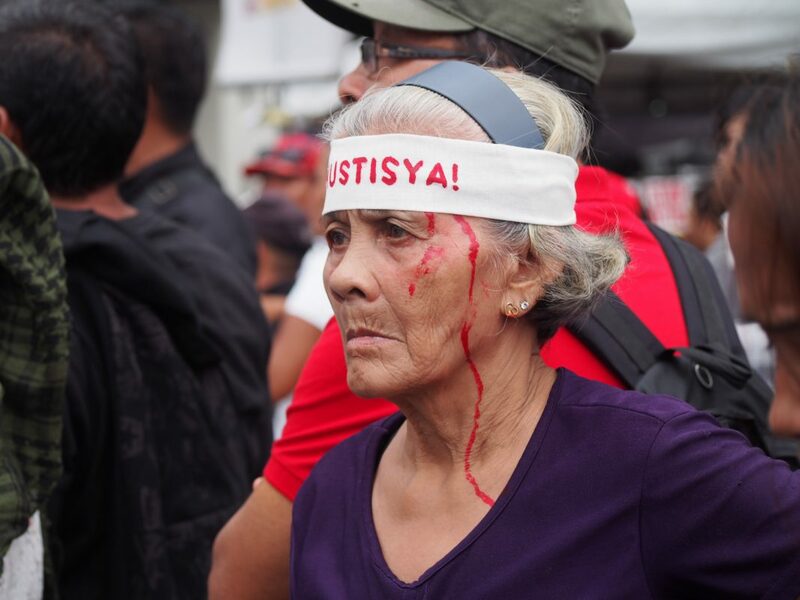 A protester poses as Pres. 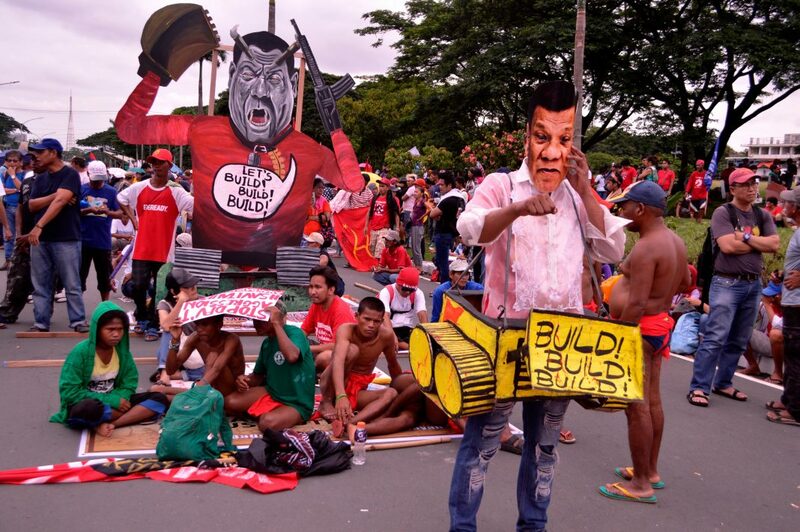 Duterte during the SONA 2018 protest in Commonwealth Avenue, Quezon City. Photo by Miggy Hilario. 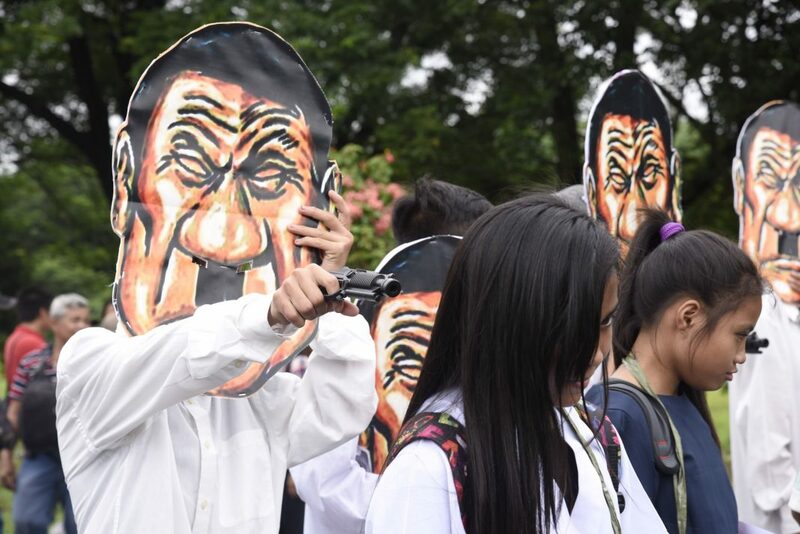 A protester dressed up as Duterte with a Hitler moustache points a gun at a student. Photo by Ulasha Gurung. 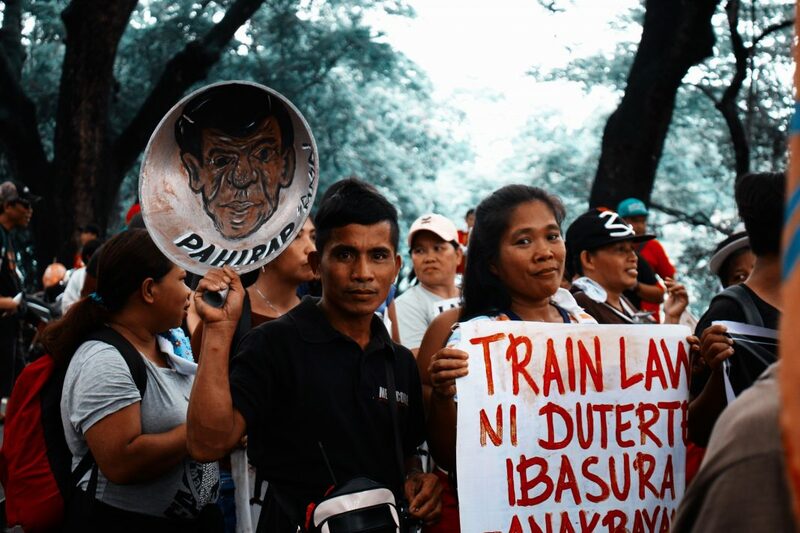 A member of urban poor group Kadamay paints an image of Duterte on a wok, symbolizing Filipinos’ suffering high prices of food and fuel products due to the TRAIN Law. Photo by Dez Rafal. 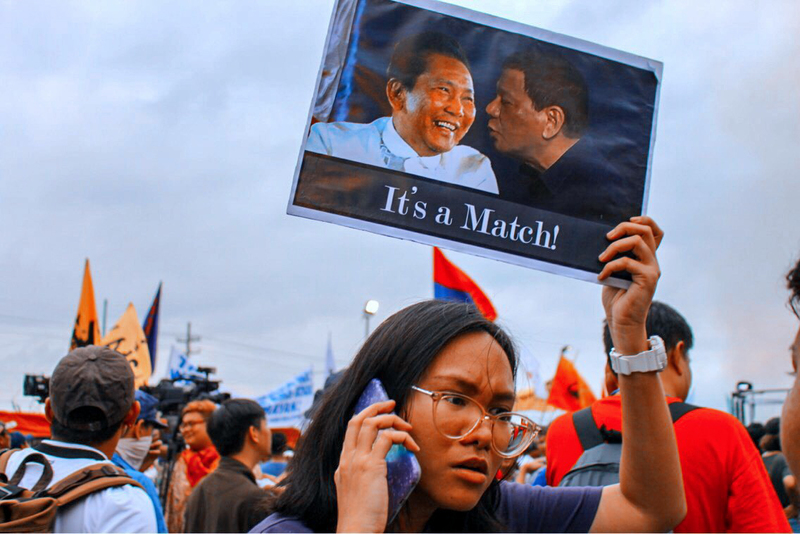 Duterte as ‘Demolition King’. His ‘Build, Build Build’ program on aims more infrastructure programs on the surface, but communities report massive demolitions of urban poor housing. Photo by Shane David. 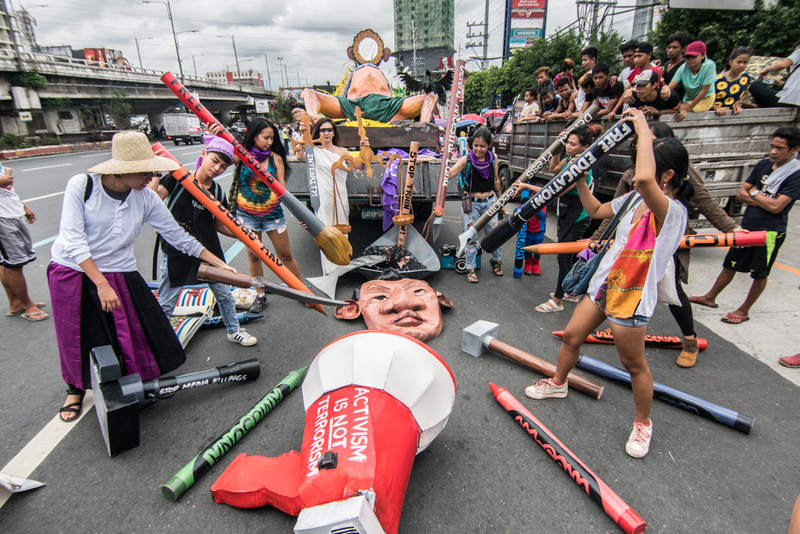 #BabaeAko advocates use different ‘weapons’ against tyrannical and misogynistic Duterte. Photo by Miggy Hilario. 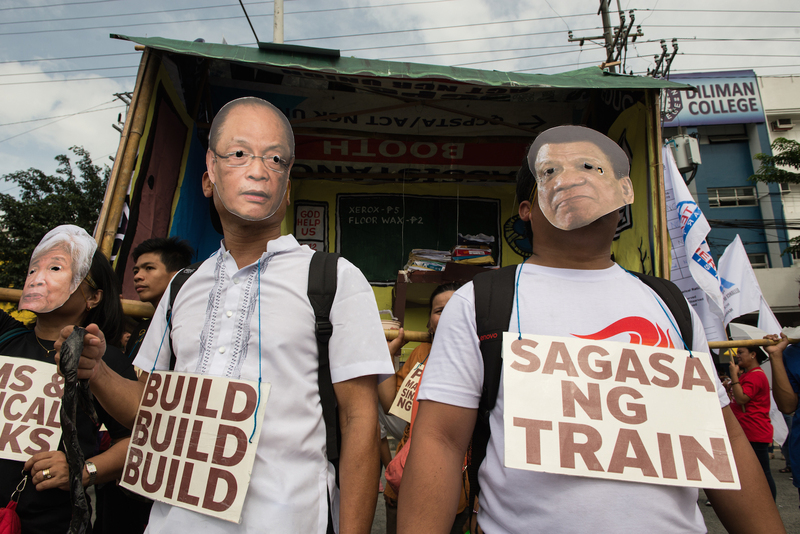 A protester wears a Duterte mask while alongside someone wearing a mask with the face of Department of Budget and Management secretary Benjamin Diokno. Photo by Pau Villanueva. ‘Dutertrain’ effigy by Ugatlahi Artist Collective. 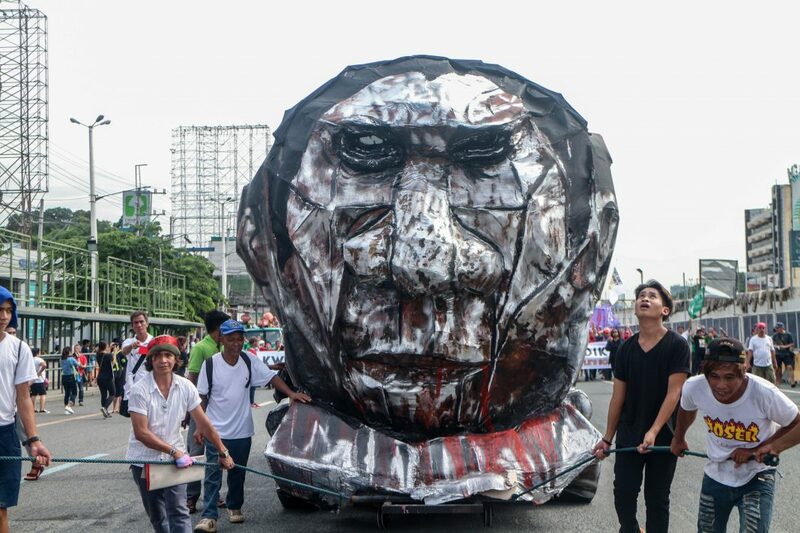 The effigy depicts Duterte as a deadly train that tramples on the rights of the people. Photo by Ryan Valiente. ‘Dutertrain’ effigy by Ugatlahi Artist Collective. 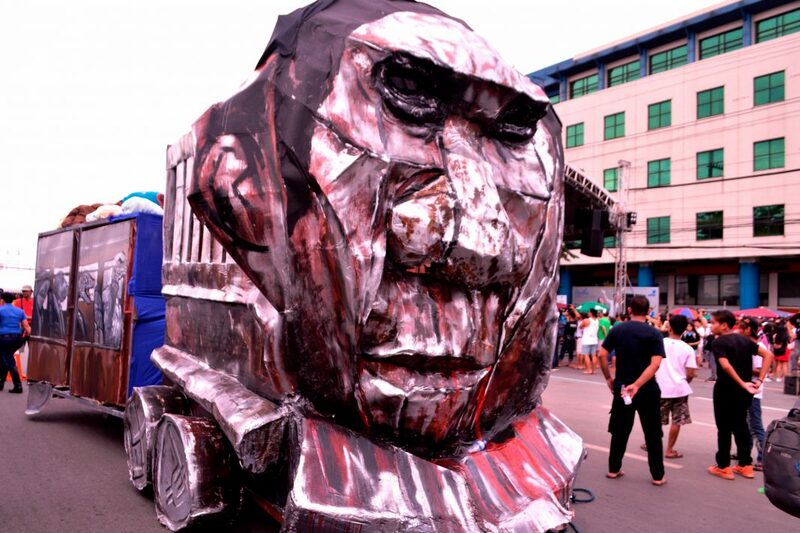 The effigy depicts Duterte as a deadly train that tramples on the rights of the people. Photo by Shane David. 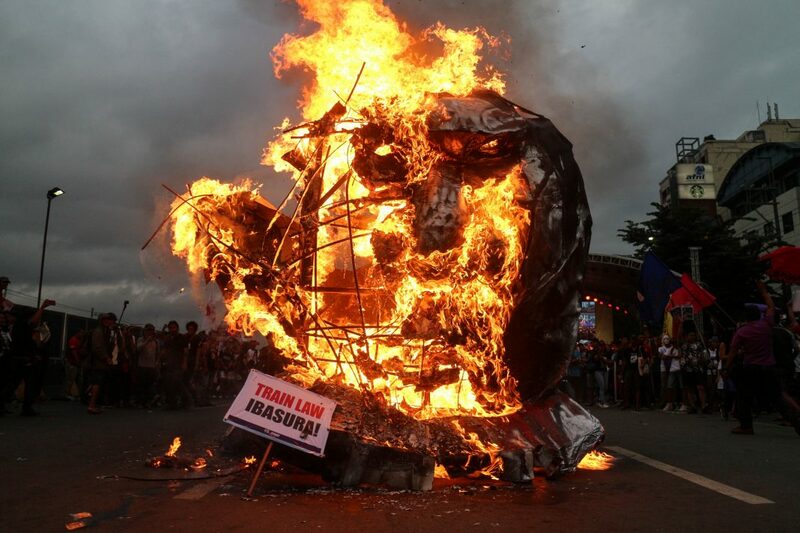 Protesters burn the effigy towards the end of the program. Photo by Ryan Valiente. 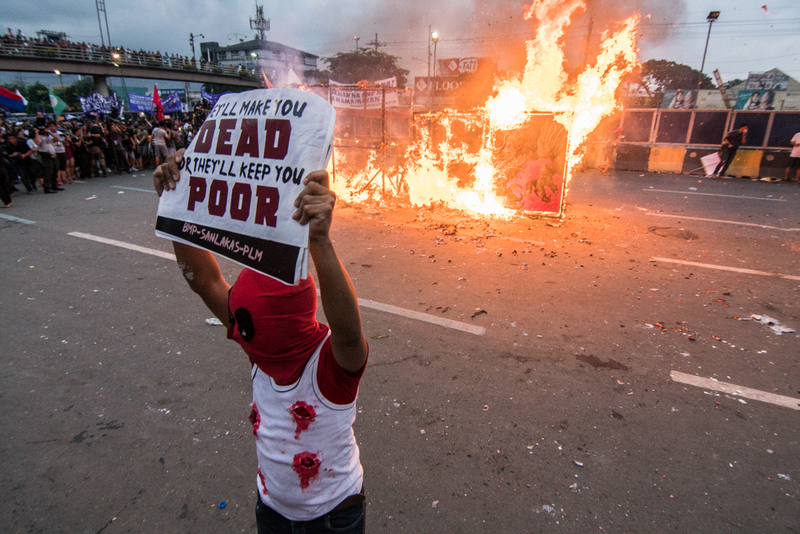 A young protester dresses up as Marvel’s Deadpool as the effigy burns on the background. Photo by Miggy Hilario. 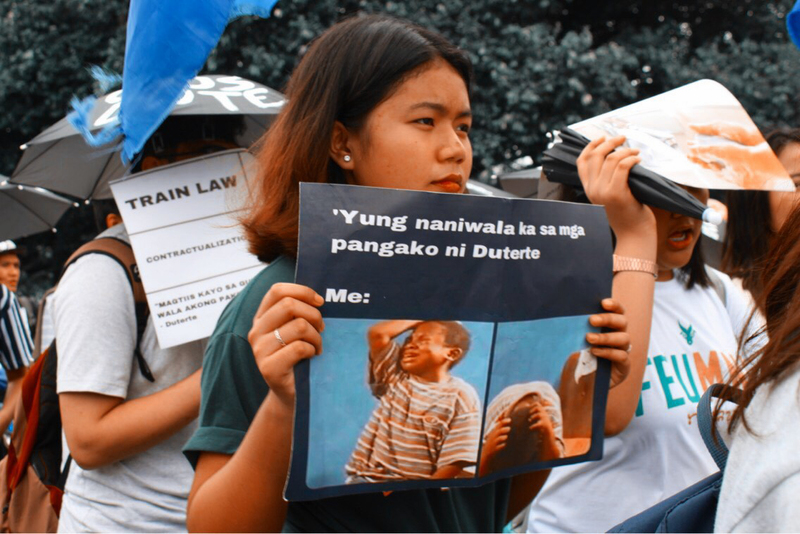 Youth protesters from Far Eastern University Manila used memes as their way to communicate their rage against the administration. 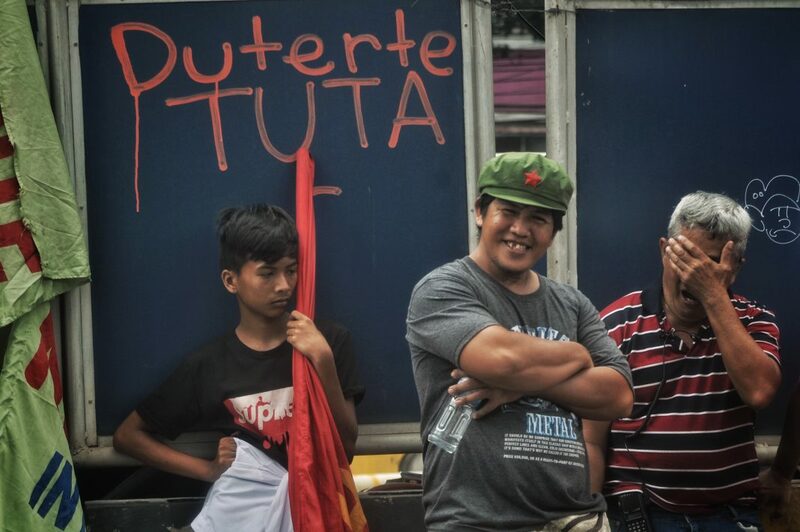 Humor and wit—this is what they cannot take away from millennials, even in the midst of battle. Photo by Dez Rafal. 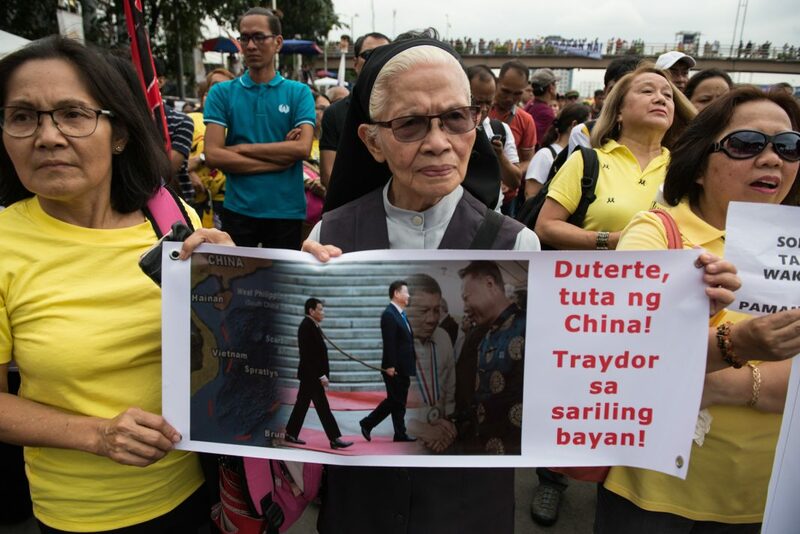 But just when we thought only millennials brought witty placards with them, an elderly nun had this. Photo by Pau Villanueva. 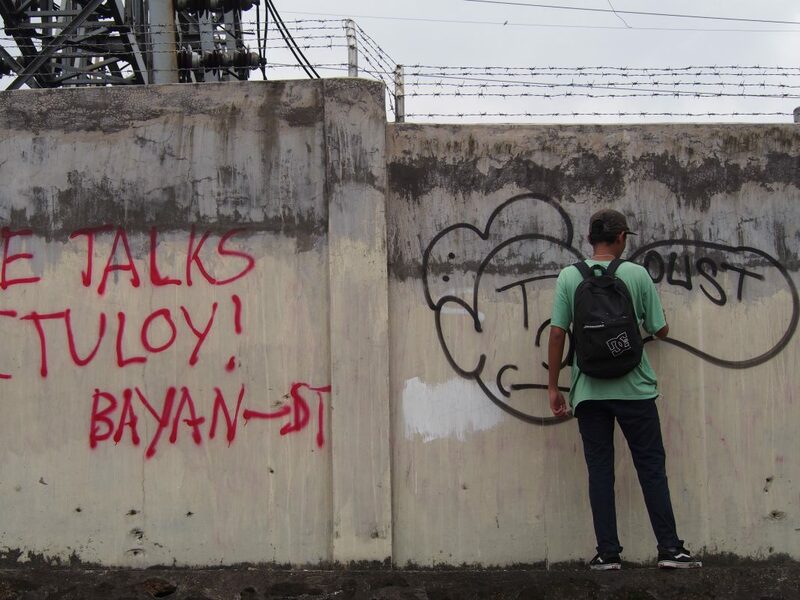 A young graffiti artist adorns the a blank wall along Commonwealth Avenue with an Oust Duterte call. Photo by Maureen delos Reyes. 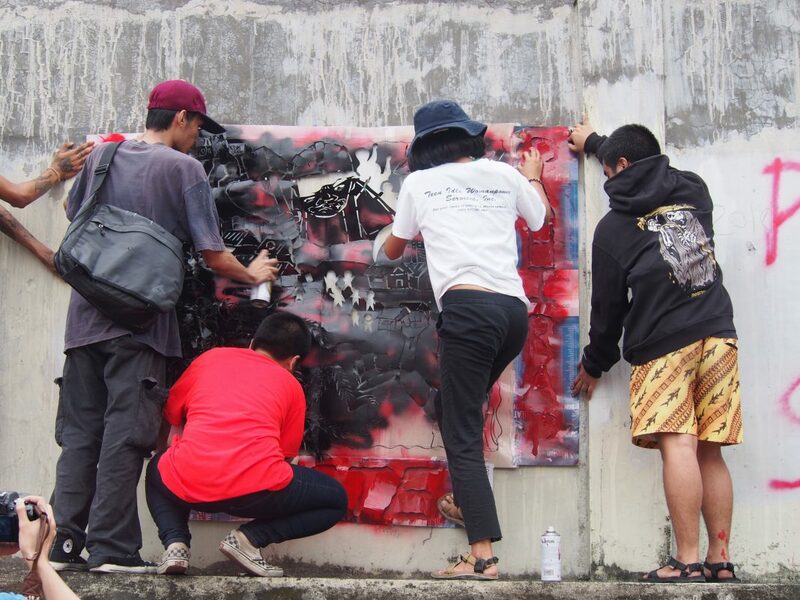 Youths work on a work of stencil art. Photo by Maureen delos Reyes. 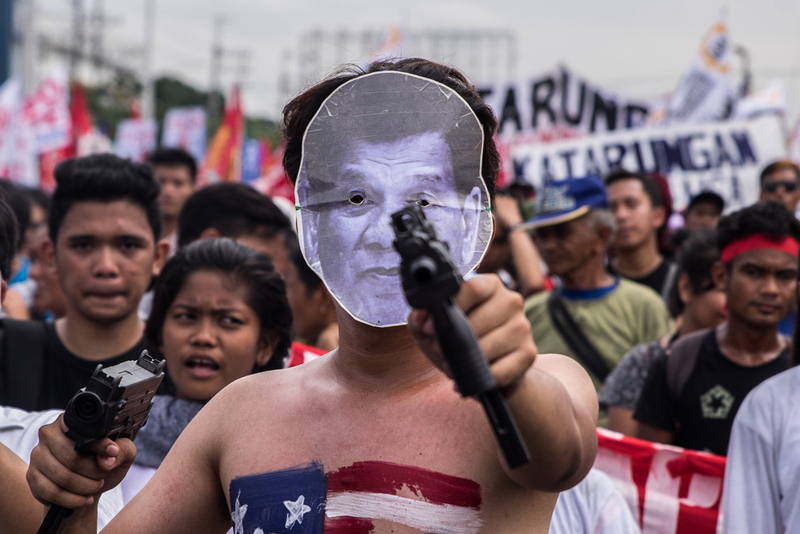 Advocates for Philippine sovereignty have nicknamed Duterte ‘tuta’, or a lapdog to economic giants U.S. and China. Photo by Mel Matthew. 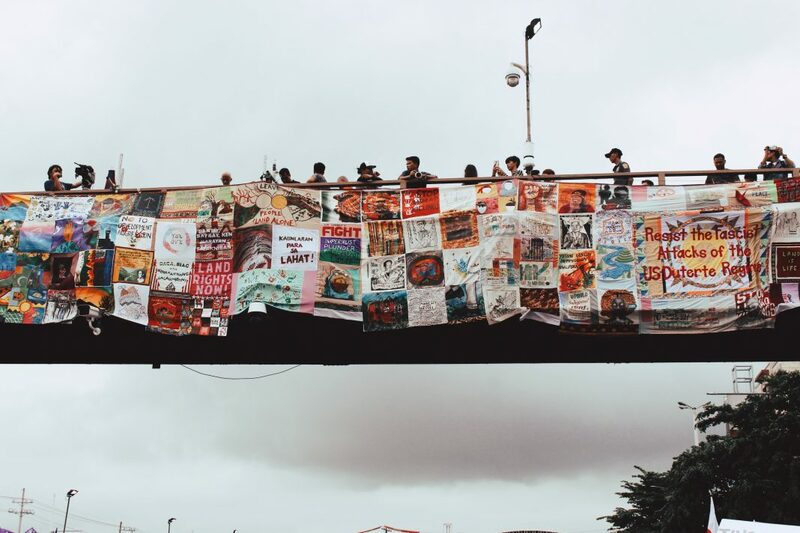 A large tapestry-like work of art is hung on a foot bridge, bearing calls against killings of farmers and indigenous people and development aggression on ancestral lands. Photo by Dez Rafal. 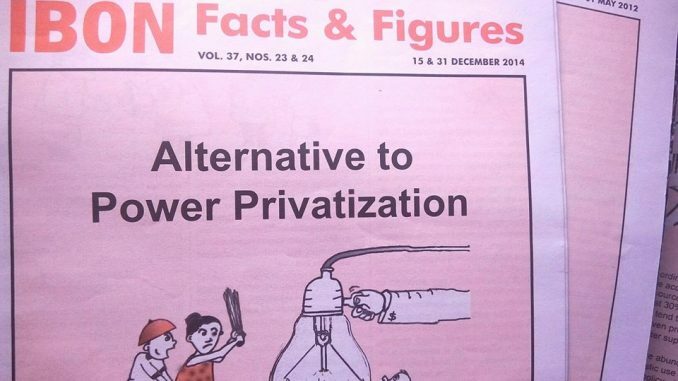 Paintings depicting the government’s various anti-people policies. Photo by Mel Matthew. 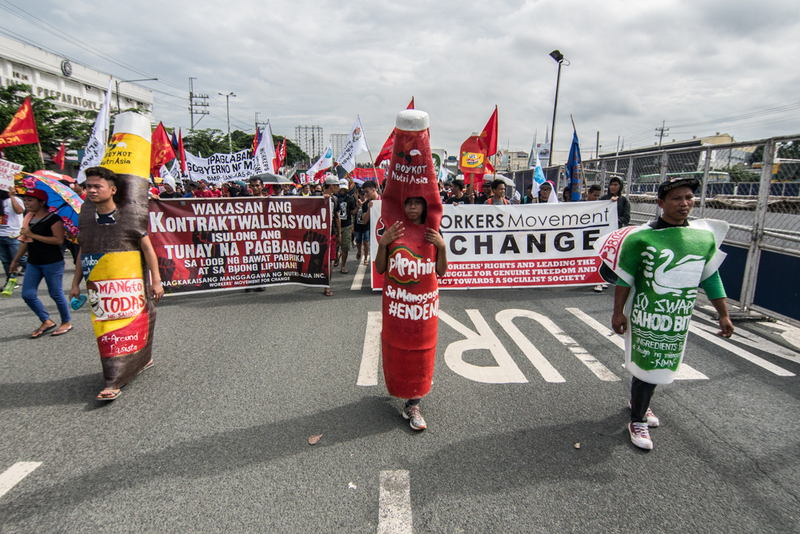 Terminated contractual workers of Nutri-Asia paraded parodied versions of the products they made. Photo by Miggy Hilario. 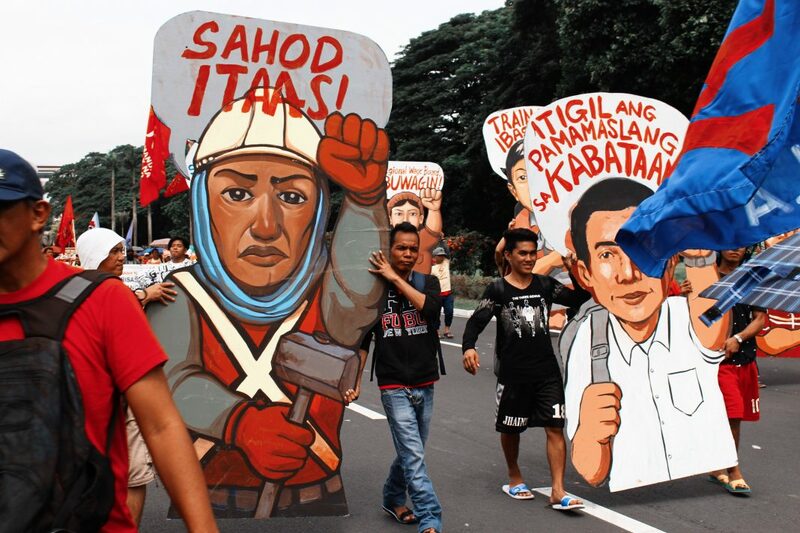 Metro Manila workers carry wooden standees bearing workers’ and students’ calls. Photo by Dez Rafal. 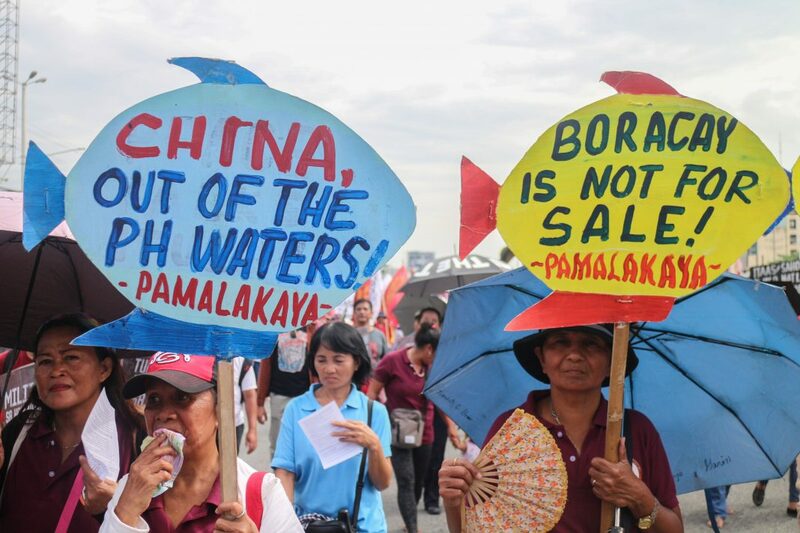 Small fisherfolk and members of Pamalakaya advocate Filipinos’ sovereignty over Philippine territory. Photo by Ryan Valiente. 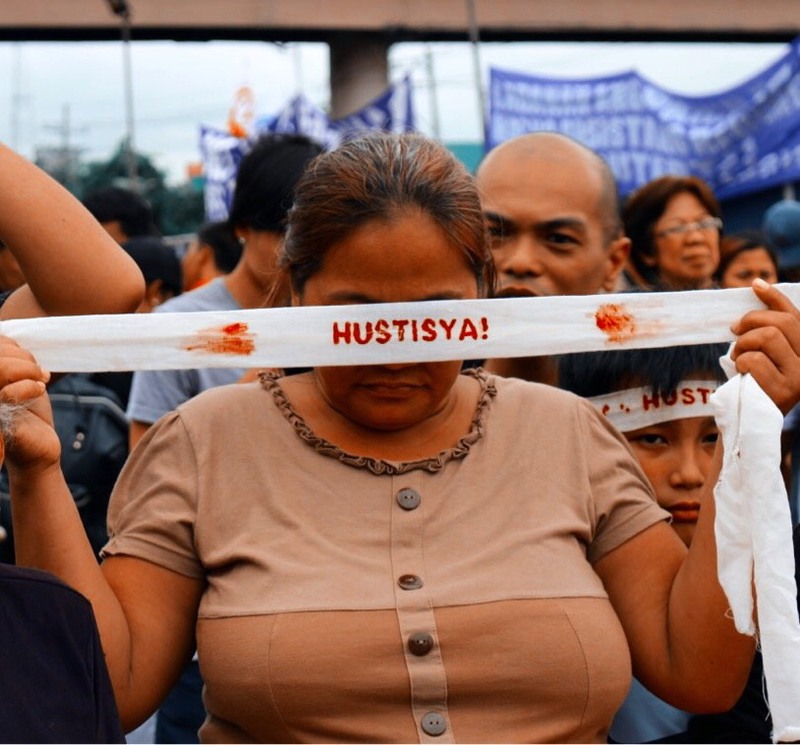 A relative of an Oplan Tokhang victim holds up a piece of cloth bearing the battlecry of many – justice. Photo by Dez Rafal. 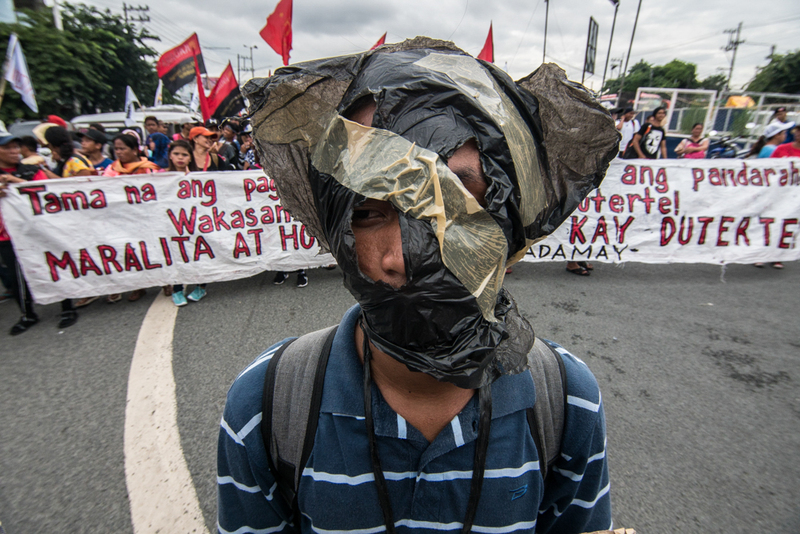 A protester wearing a piece of taped black garbage bag portraying EJK victims. Photo by Miggy Hilario. 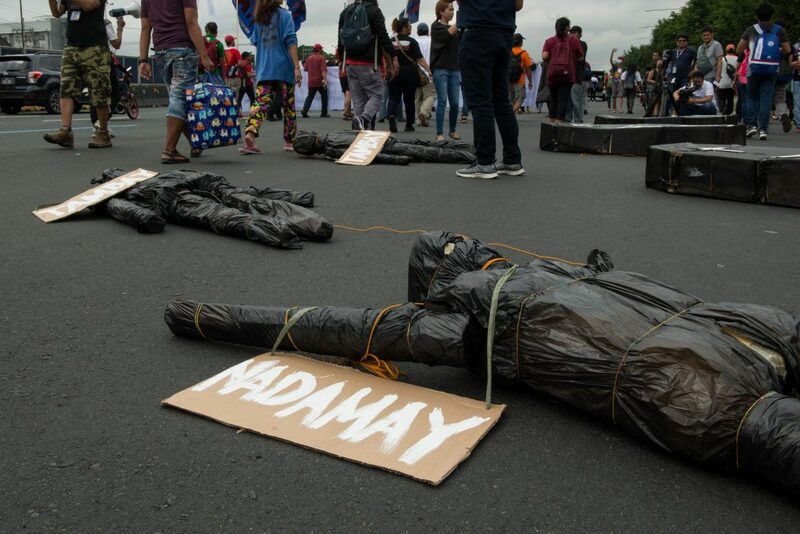 A group depicts victims of extrajudicial killings because of the government’s war on drugs and police operations to arrest ‘tambays’ or loiterers. Photo by Pau Villanueva. Photo by Maureen delos Reyes. 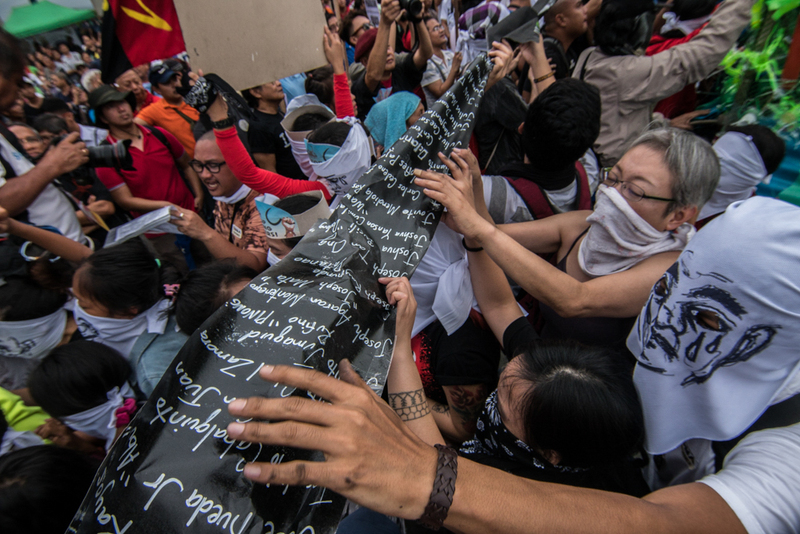 Artist group RESBAK gave a moving piece where performers passed a long list of victims of the government’s war on drugs, Oplan Tambay, and its so-called counterinsurgency program in the countryside while some names were said out loud. Photo by Miggy Hilario. 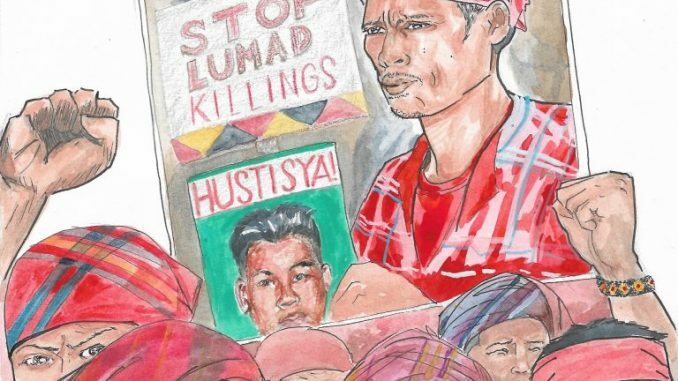 Artist group RESBAK gave a moving piece where performers passed a long list of victims of the government’s war on drugs, Oplan Tambay, and its so-called counterinsurgency program in the countryside while some names were said out loud. Photo by Alyssa Recuenco. 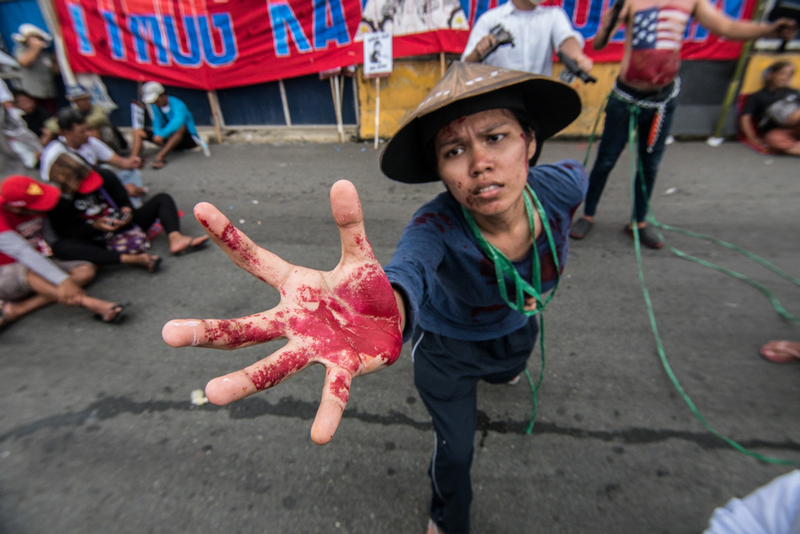 One performance depicted the plight of farmers due to heavy militarization in the countryside. Photo by Dez Rafal. Cultural workers from Southern Tagalog perform a piece about peasant killings in their region. Southern Tagalog is the second most militarized region in the Philippines under Oplan Kapayapaan. Photo by Miggy Hilario. 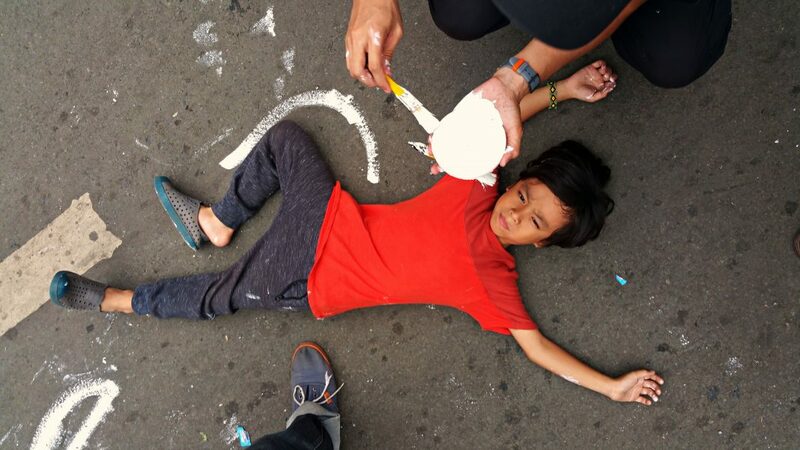 Artists from Sama-samang Artista para sa Kilusang Agraryo (SAKA) paint outlines of “dead bodies” on the street. Photo by Patrick Caraig. 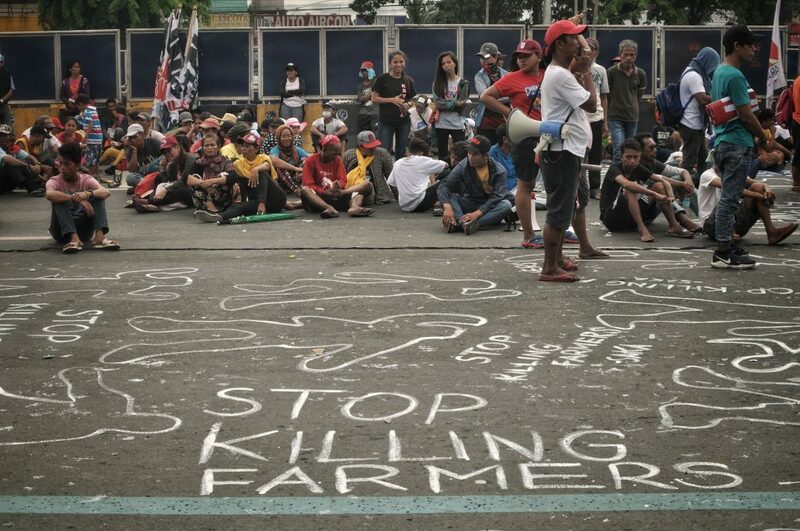 Artists from Sama-samang Artista para sa Kilusang Agraryo (SAKA) paint outlines of “dead bodies” on the street. Photo by Mel Matthew. 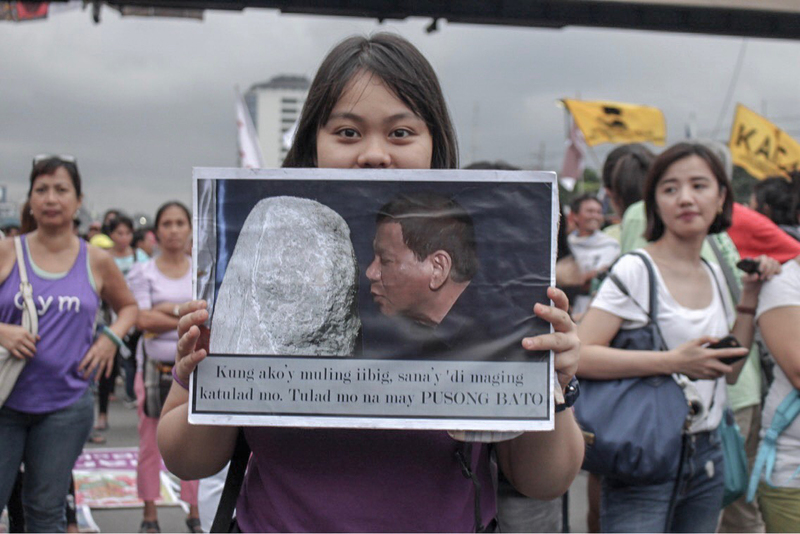 The post IN PHOTOS: Art and dissent at the People’s SONA appeared first on Manila Today.